Gain a foundational understanding of gastrointestinal physiology and how the GI system functions in health and disease. 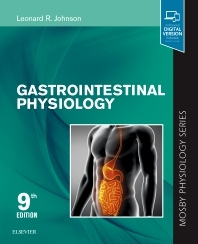 Gastrointestinal Physiology, a volume in the Mosby Physiology Series, explains the fundamentals of this complex subject in a clear and concise manner, while helping you bridge the gap between normal function and disease with pathophysiology content throughout the book. Leonard R. Johnson received a Ph.D. in physiology from the University of Michigan and then trained with Dr. Morton I. Grossman at UCLA. He spent 17 years as a Professor of Physiology at the University of Texas Medical School in Houston before moving to the University of Tennessee Health Science Center as the Thomas A. Gerwin Professor and Chairman of the Department of Physiology. He is the author or coauthor of over 250 papers on gastrointestinal physiology and holds an NIH MERIT Award. Currently he is the Vice Chancellor for Research at Tennessee.